Last issue I wrote about the origins and popularity of Halloween as a spooky time to think about those things that scare us. This week I am going to talk about something that is so scary that most men can't even bring themselves to speak its name out loud. Marriage! So, what could be more natural than combining a holiday about Death with "Til Death do us part?" And that is exactly what my husband and I did one year ago. There I stood, with one son on each arm, gazing down the aisle at the knight that I would spend the rest of my life with. My eldest son was dressed as The Phantom of the Opera and my younger son was attired as Death, complete with black gauze wings and a scythe. As they escorted me down the aisle, I gazed upon the assembly, curious to see who had decided to witness this momentous occasion. I was pleased to see such a wide variety in attendance. There were some pirates, a naughty cook, a dark fairy, the doctor in his scrubs, the hippies, the vampires, the undead and even the DJ from the 1950s in her poodle skirt. And, of course, the contingent from the medieval and Renaissance eras came in satins and brocades to match the bridal party. While we were having the wedding on Halloween, I had decided to go for an Autumnal décor. Instead of having the Maid of Honor toss flower petals, I thought that Autumn leaves might be better. And Jack-o-lanterns lay about the landscape with Fall garlands and accents. Each guest received their very own ceramic candy holder in Fall colors to take with them in remembrance of the occasion—filled with candy of course. After all, they gave up their trick-or-treating to attend our wedding. So Death and The Phantom finally brought me to my would-be groom and gave their blessings that I was now his responsibility and thus the ceremony began. I had decided that my soon-to-be husband and I would dress in gold and silver. So, my Celtic inspired gown was gold brocade and my fiancé was in silver brocade and black velvet. Our officiant was dressed as a druid priest. As the ceremony unfolded, we treated our guests to an old-time handfasting ceremony that entertained and educated at the same time. My inspiration for the ceremony came from a website I have listed below. After the ceremony, the photographer took a few formal pictures. Then, we had a plate of finger food, fired-up the bagpipers, and gave outdoor prizes and prizes for best costume. We finished off the evening by dancing to new Celtic music by Blackmore's Night (see below) as well as some fun oldies songs like, "The Monster Mash." All in all, I think everyone had a wonderful time, and my new husband and I received many compliments on how this had been such a fun wedding to attend. Because it was the second wedding for both of us, we thought we would just have a really good time with it. The last thing we wanted it to be was formal and stuffy. We’ve now been married for almost a year and I still have so many fond memories of the evening; and, so do our friends—they still comment on the fun they had! Now you may be thinking, “What on earth made you want to get married on Halloween?” Believe it or not, Halloween is a date that many couples are choosing to perform their nuptuals. For us, it was the anniversary of our first date and it is a day that both of us can easily remember. 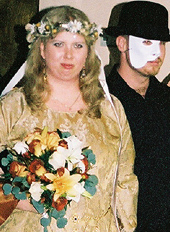 Halloween is popular for pagan weddings because of the New Year/New Life symbolism. It is popular with devotees of goth culture for obvious reasons and nearly everyone else because of its associations with parties and fun. 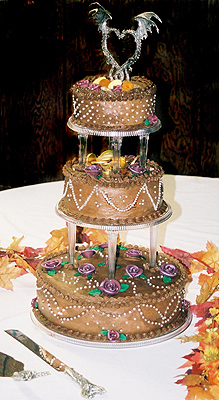 Here are some websites about Halloween weddings: K.A. Laity has devoted an entire website to her Halloween wedding. Catherine Greene and Nicholas Doubleday share their Halloween wedding experience on the web as well. Tonya Jordan at Best Wedding Articles gives some advice on how to keep your wedding formal and still have it on Halloween. For the ultimate Halloween-themed wedding, you can get married anytime of the year in Las Vegas inside Dracula's Tomb, a Haunted Graveyard, or have a Rocky Horror Wedding. Visit GothicWeddings.com for the details. Regardless of your motivation for choosing to wed your true love on Halloween, you can be assured that the diversity of the holiday will make it easy to plan your perfect day. You may choose spooky and scary and have the horror wedding of your nightmares. A mythical or legendary theme could give your guests some wonderful ideas for their costumes. Who wouldn’t want to have Zeus, Aphrodite, Pan and maybe even an elf or a dragon in attendance? A medieval or Renaissance theme is always fun. It could be the bride’s opportunity to dress as the Princess she’s always dreamed of being and give the groom the chance to be her Knight in Shining Armor. Then there’s the classy gothic theme with wonderful dark elegance everywhere you turn. Halloween is so versatile that you can opt for anything from fun and frivolous to classic and formal. Your options are endless. If you want to add this article to your list of favorites or email it to a friend, please use this permanent URL, https://stores.renstore.com/-strse-template/0709A/Page.bok. Permission is granted by the author to quote from this page or use it in handouts as long as you include a link back to Renstore.com.